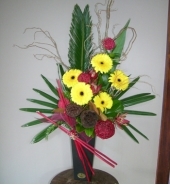 Bouquets consist of gorgeous blooms put together with originality and flair! Every colour range is available whether you prefer bright funky colours, pastels, blues or yellows, pinks or rustic delights. All bouquets are presented with beautiful quality wraps.